My main shop is about 300 feet from the house, 10 x20, uninsulated and unheated, and it doubles as storage space. It's okay for summer use but pretty tough for winter work -- and steeply down hill. Kinda creepy walking there through the dark woods at night, too! 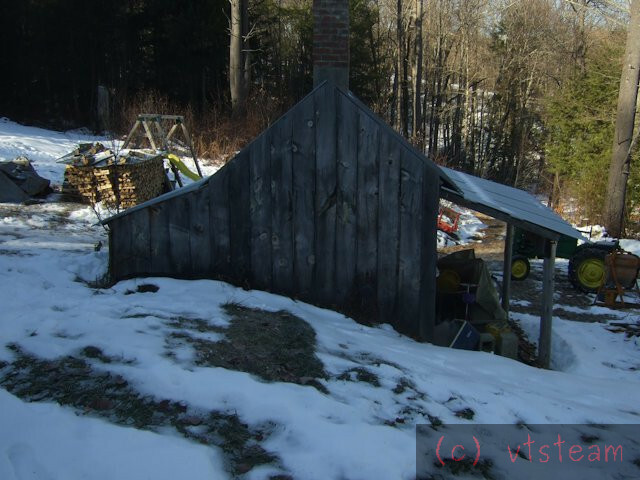 I have another small shed only 20 feet from the house that once housed a wood furnace I built (HAHSA type). It's built of concrete block and has a metal roof and also features a built-in brick chimney. So it would be ideal for a small cozy shop to work in evenings. It should be easy to heat There is 3" foam insulation on the outside of the block, giving a good thermal mass. And one end is actually underground, since it's built into a steep hill. Heat retention is very good. The only problem is, it's tiny -- 6 feet by 8 feet, and the chimney comes down to the slab at one end giving a practical floor space of really more like 6 by 6 feet. Still I think it's usable -- a small space is better than no space! So I built up the floor a couple weeks ago with a couple inches more concrete (it used to drain in from the door instead of being level), and have started to make two full length benches. They can extend beside the chimney -- so can be full 8' long. 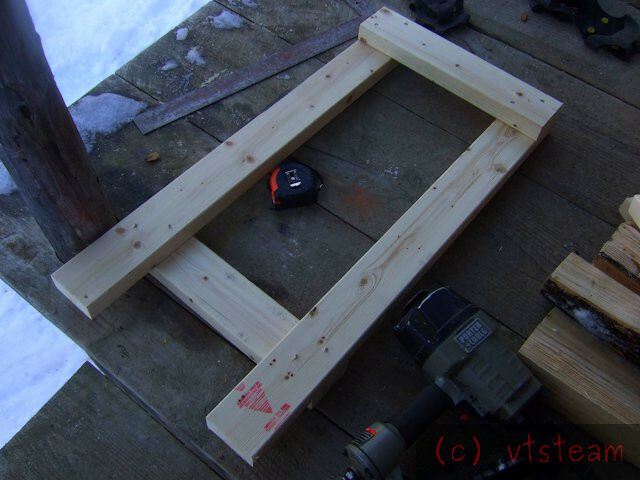 Top width on one side could be 24" and on the other side 20" to clear the door. Two full length benches would take up 44 of the 72 inches available, leaving an aisle of 28" between them. I think that's tight but do able, and I figure I'll mostly be sitting down anyway. I suppose I could reduce wider bench to 20" and get an aisle of 32". But I'm not sure if that will really make much positive difference, and a wider bench seems to me to be more useful. I know the basic machines I'd like to put in there -- all of which have been stored and and unfortunately attacked by surface rust. They need TLC -- and the new shop is just the excuse needed to restore them to good condition. And if I can figure out how to do it -- I'd like to convert the lower block portion of the chimney to a miniature forge and melting furnace. It could then also provide heat, though I'll have an electric oil filled radiator in the shop as well. The jigsaw and sander will be used for pattern making, and the sander can double as a tool sharpener. If I need to take off serious metal I can always go down to the bigger shop and use the bandsaw and grinder. The workbenches will be built from wood with drawers -- I started on the 20" side today. The small tools will make it seem like a miniature version of my larger summer workshop which has a 12" lathe, round column mill/drill, etc. I'll try to get some pics tomorrow. I'll follow this with interest Steve not sure of the forge idea though in such a tight space. One thing I'd say though, 'split site' working can be a real pain as the tool that you want is ALWAYS in the other workshop. Or even worse, you think that it is, go find to find it, and find that actually it's where you started. 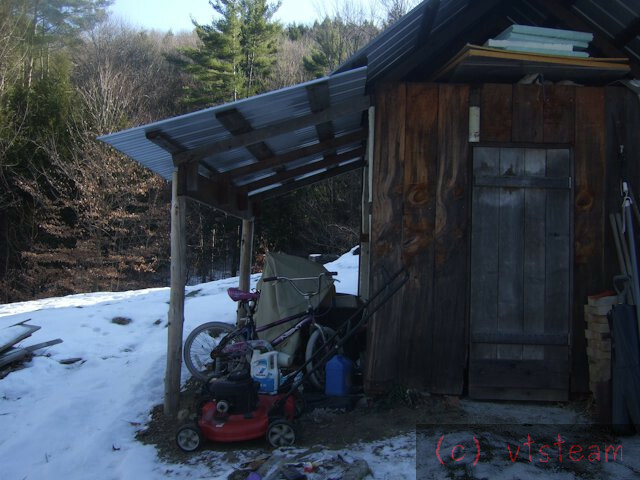 With the amount of ground you have is there no possibility of long term building a new larger shed close to the house? Sounds like 'split decision' time I would go for the nice cosy option in winter, could you not rig up a forge in your big shed, will add heating when you're in there ..
Hi guys, thanks for the comments! Andrew, the land near the house is on a steep grade, so it would take a lot of earth moving to get a big enough level space where I'd want a shop, and honestly I don't have the time or funds to do much building right now. The benches and concrete for the floor for this space are the limit of what I can spare at the moment. I definitely agree that what you want is always in the other shop in situations like this, but I just have to put up with it. It's better than not working at all this winter. 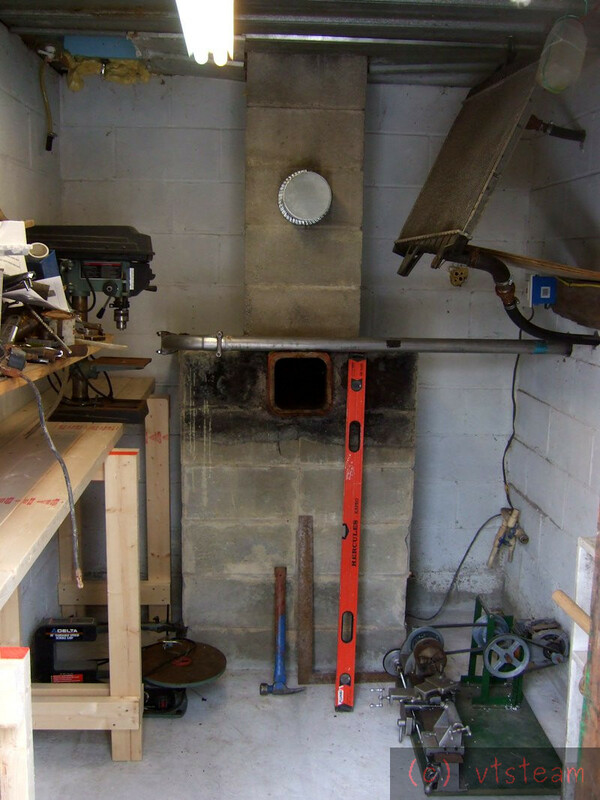 Mechman seems like a reasonable idea but a forge/foundry in the larger shop would be difficult/expensive because it's presently just a raised wooden floor shed on piers, and no existing chimney. And insulating that building would be a major project -- especially with all that's presently in it. I do have a furnace outdoors there, but with the amount of snow we get, it just isn't possible to use in winter. And it still doesn't solve the long distance at night problem. I think the micro shop will be the most do-able option, this year, at least. I should have mentioned -- the little cement block shop does have additional space outside that is covered by lean-to roof additions. Poured a slab under one side last week as well -- that could serve as a foundry location for a bigger setup, though no chimney there. But it is open at the sides and the roof is metal -- I could put in a stovepipe chimney fairly easily. That is if I can get various outgrown kid bikes and other non-necessary storage junk out of there. Time for a secret dump run. Seems like every time I build a space for myself to work in, it fills up with odball storage items as soon as I turn my back! Well, my fault, too I keep thinking Everything can be used for something else. But I'm starting to feel more ruthless about getting rid of stuff these days. The other side addition houses my Lister diesel type generator -- and it is plumbed to supply heat to the block house section already via the radiator. So if I run the generator I can get heat from just that as well. 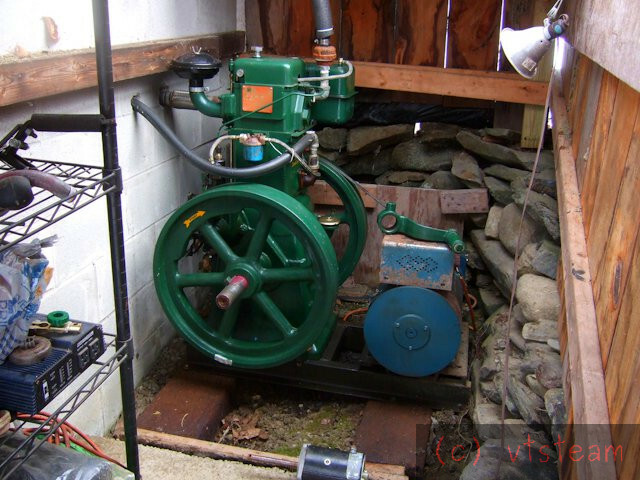 But I already have grid power to the shop, so the generator isn't necessary. Still, it's fun to run. If you are on a steep slope to the house, is there any mileage thinking of a construction UNDER the house as a shop? I know that you built it yourself, so you know what's structural and what's not. No Andrew, that's not possible. The house is on concrete piers, 15 of them. Drop offs on 2 sides -- one side is probably 20 degrees, though there is a cantilevered house section there of 10' x 20' that could be deepened -to give headroom - but essentially inaccessible without road building, etc. I'm hoping to use my rehabilitated backhoe next summer to make some changes around the house in general for better access, but not this year. After checking my Atlas mill and Gingery lathe, I think the 20" wide bench I started yesterday is just too narrow for them. And I think the 24" bench (not started yet) is going to take up too much aisle room for me to be happy with both -- at least if they are both full length. So I may be shifting things around today and also shortening bench plans. In fact I might have to eliminate the Atlas mill altogether, which wouldn't be a tragedy. I built extensive milling attachments for the Gingery lathe. And it's more fun to use something you built yourself. I just hate the fact that I never use that Atlas mill for anything and I've got a big range of tooling for it. 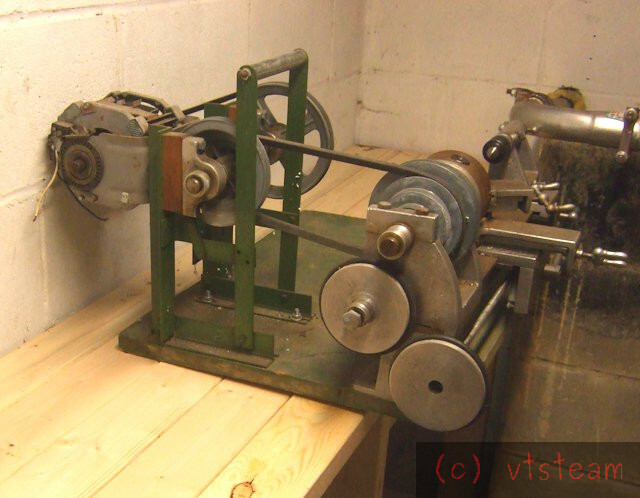 But it really wants mounting on a bench corner as a minimum -- you really need access to 2 sides of a horizontal mill. Full length benches have no corners! Maybe it's time to think about selling it. Having been grossly overcrowded at my last place, I've developed the habit of trying to make as much possible to be moveable on castors. Could you have the lathe and mill on custom wheeled trolleys that can be moved to give access as and when needed? My bigger stuff is mainly sorted so that I can get a pallet jack under it to roll it out of the way when needed. So you (perhaps) could have a bench down one side, and the moveable machines down the other or some similar sort of idea? I feel you pain regarding the space problem. 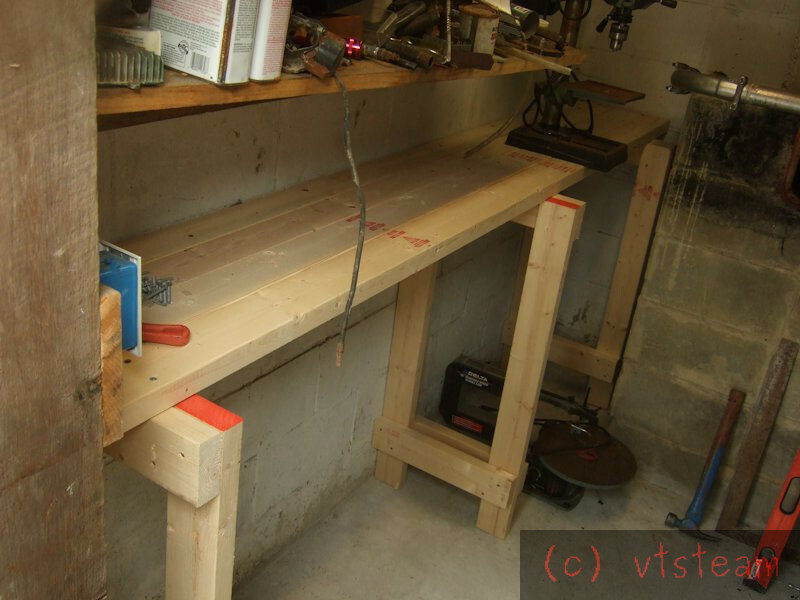 My big shed seemed quite adequate a few years ago, But when I added a large radial arm saw and a couple of benches it suddenly wasn't so usable. In fact the saw will have to go, I don't often us it, and it really take up a lot more room that one would think. I can really recommend the small heated shop.Sadly mine isn't big enough to take the Denford Viceroy. That has to await big shed modification, phase four. As a noob to the site I have been following your threads vtstream and would love to see pics of your Gingery and additions. As someone who has little to no space looking forward to seeing pics for your mini-me workshop.. Finally, here are some pics to show you what I'm talking about. Shed from back (in ground lower wall). You can see the two side extensions and chimney. From front, left extension. Slab just poured with bikes/storage already on it. Interior of the central block house, showing chimney, partially decked 20" bench on left. The distance to the walls from the chimney is 20" on each side. The door is offset to the left. The right side could be 24" and still clear the door. Left must be 20" to clear the door. The upper crowded shelf on the left is left over from earlier and will be removed. The radiator upper right is for the generator and can heat the shop. Bench partly planked -- giving a better view of the size (8' long). Interfering shelf will be removed. I went into more detail here (if you havent seen this already). Looks a little compact but completely doable. You could have a cozy winter workshop soon. I used to have that drill press! There aren't many sites where you can write that and not have the moderators ban you. Looking at your shed, may I suggest that you change the chimney stack from concrete to a cast iron tube. I have a pot belly stove in my big shed and I find that most of the heat comes from the iron chimney, not from the stove. Thanks a lot, don't know how I missed that! Thanks David it doesn't take much to heat that tiny insulated space. I don't want to tear out the chimney. I also have an oil filled electric radiator, that I probably will use a lot of the time anyway. Eric, I sure have drilled a lot of holes with that drill press since 1995! -- TThe last 8 years it's been in storage along with the now somewhat shabby Gingery lathe. This new shop Is a great reason to bring them back and fix them up -- really happy about that. I always liked working with the Gingery -- more than the 12" Craftsman that I mostly use now. The QC toolholders I made a couple years ago fit both, so this should make the Gingery even better. I removed the shelf over the 20" bench and set the Gingery on it. Photo below. Sticks out quite a bit. But if I move the motor on top of the jackshaft instead of in back of it, I can lose about 6" of width for the lathe footprint, and it will fit. So, if I don't use the Atlas mill, I won't need a 24" bench on the other side -- I can go with 20", and that will make the shop feel roomier. And possibly allow the furnace idea down the road. If someone was really clever they would move the whole drive section over the top of the headstock, and maybe even create a mini lineshaft to drive a Pott's spindle. But not me, at this point! Could you remove a corner of the chimney breast so you could make a wider shelf in the corner for the mill. That might go some way to meeting the requirement for access from two sides. I could do that Russell, but I think I'm going to wait and see how it just feels with both benches in place. I think I want the aisle in the center to be 32" instead of 28". If I do add a small foundry/forge/stove opening, I'll have to cut out some of that block for it. I'll need the width, at least temporarily, to support the chimney while I've broken away the center, before I've reinforced the opening with fire-brick. So I'm going to leave the whole structure as-is for now. Today I cut wood and made up 3 sets of legs for the right side bench. These are shorter legs -- 34-1/2" to yield a 36" finished height. The left bench has a 40" finished height, which feels okay for some things but high for others. A framing nail gun is overkill for making these, but since I have it, it does make holding alignments easy compared to pounding in nails.